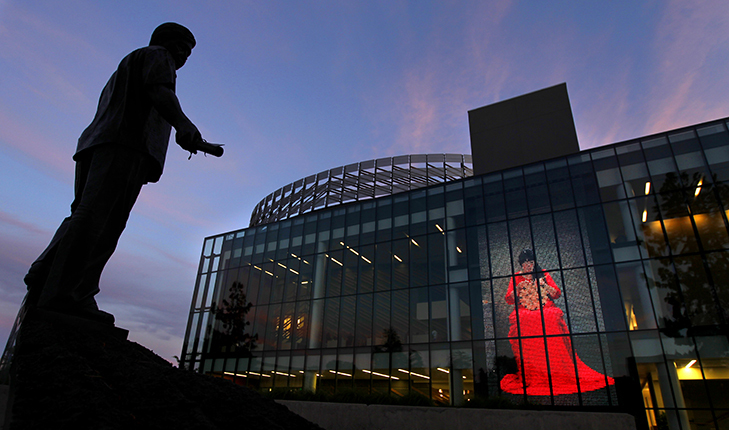 When the sun sets west of the Henry Madden Library and the glare from the hot Fresno sun disappears, the lady in red glows. 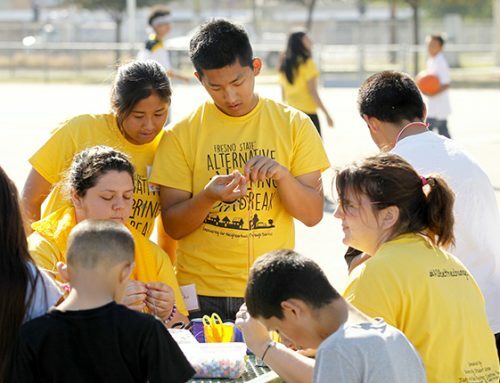 The tribe has supported numerous efforts to improve health care and education in Central California over the years. The five-story elliptical tower of glass, steel and angled wood lattice — resembling a twined cooking basket — at the main entrance to the library is named the Table Mountain Rancheria Tower in honor of the tribe. “The elements of the culture and all of the motif and the artwork gives this real interesting element and sense of history to the (library) space,” said Del Hornbuckle, dean of library services. The basket weaver video is “so beautiful, it’s so bright and it’s so massive, and in front of the Peace Garden. It just completes the elements for me. You’ve got this beautiful visual of her making something beautiful,” Hornbuckle said. Over the years, the library has become the focal point of campus for all who work and study at the University. It has also become a gathering place for the general public as host to exhibitions, guest speakers and other activities that allow local residents to learn and grow. 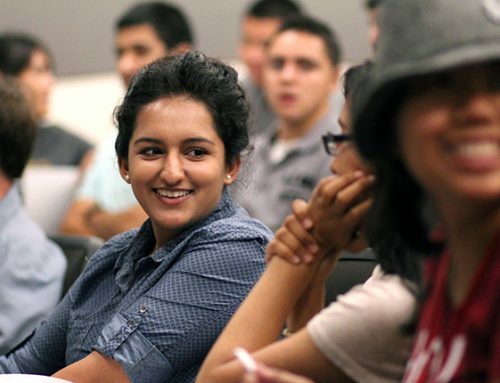 But many new students, faculty and staff don’t know the story behind the lady in red. Some don’t even know she’s there. The video called “Weaving” was created by Los Angeles artist Susan Narduli with help from Hollywood digital media experts. Narduli and the crew set up video equipment in Conner’s Coarsegold home where she could record herself working eight hours a day, almost every day, over two years. Conner wore a long red dress (three were made for her) and she sat in a chair next to a small table with a bowl of water that helped her keep the basket grass wet. A small button on the table allowed her to turn the camera on and off. The video is projected onto a digital Mediamesh curtain — a stainless steel wire mesh interwoven with LED lights — mounted on the inside of the library’s north-facing glass wall. It’s transparent from inside and visible from outside where the image subtly changes throughout the day with variations in sunlight and shadows reflected from the garden. On the library’s second floor, LCD monitors on both sides of the elevator play a close-up video of Conner at work — her facial expressions, her hands, and the basket. She inspects small pieces of grass, uses her favorite orange scissors to cut them in half and cradles tools between her fingers and on her lap. Connor has a pocket knife, a metal awl and a deer bone awl made from a deer’s lower leg bone. “That’s what my grandmas would use to open stitches with,” Conner said. She flips the basket back and forth and occasionally pulls it in front of her face. Conner said she used the basket to shield her face when she needed to cough or laugh from listening to movies that she played in the background. The film “Titanic” was one of her favorites at that time. The basket made in the video was on display in the library after the building opened but is now owned by Table Mountain, Conner said. Conner has been back to campus dozens of times since the new library wing opened. She jokes that no one recognizes her. Her long black hair has since turned grey and she’s lost about 70 pounds, she said. But it’s fun to grab a seat and hear people talk about the library’s basket weaver. The Native Plant Garden just outside the library entrance is a no-irrigation, organic garden with native plants, trees and grasses used in basket weaving. Names of plants and tools are etched onto a low granite wall in Mono, Gashow and English. The rich earth-tone colors in the library were inspired by the vibrant lichens found on boulders in the Table Mountain Rancheria. The colors are specific to each floor or area of the library. The design of the granite entry inside the library was inspired by a Coinumni basket from the Table Mountain Rancheria museum collection. The same granite is used in the fourth floor north entry. The grand staircase is covered in woven, stainless steel mesh honoring Table Mountain’s basket-making tradition. The stairs also reflect the mountains of the region and symbolize the journey of learning. Custom fabrics on lounge and upright chairs were inspired by basket patterns — the deer hoof, butterfly and stair-step. Mosaic glass artist Erin Adams created three lighting pieces in the Starbucks seating area on the second floor that incorporate the basket weaving theme. The Table Mountain Rancheria Reading Room on the third floor has an 11-panel, nine-foot by 30-foot glass mural that tells the history of Table Mountain Rancheria.